The senior housing industry is gradually embracing technology in its wellness initiatives but is still just scratching the surface. That’s according to an active aging industry trends survey recently released by the International Council on Active Aging’s (ICAA). The survey found that senior living providers are shifting away from a care-focused operational model to one that is focused on wellness. However, providers are not yet making significant investments in technology to drive this change, which involves programming targeted at multiple facets of wellbeing, such as physical, social, spiritual and intellectual dimensions. There are myriad reasons for the slow integration. Senior housing operators must evaluate building infrastructure and geographic location, what tech devices and platforms are the best fit for residents and staff, software requirements for specific platforms such as electronic health records or fitness center attendance, adding layers of privacy for residents’ financial and health information, and costs for purchasing, implementing and maintaining devices and software. While facing all these potential challenges to technology investments, this reluctance to embrace technology is attributable to a natural conservative hesitancy to avoid innovation until it is completely workable, Ziegler Link-Age Fund II Chief Investment Officer John Hopper told SHN. The fund, which closed with $37 million in capital commitments in May 2018, is an investment vehicle affiliated with specialty investment bank Ziegler focused on senior housing technology. The demand for tech that supports wellness is being driven by consumers. ICAA research showed that 44% of senior housing residents, spurred by the growing popularity of wearables such as pedometers and step counters, are interested in purchasing software in the next couple years which will allow them to track participation and outcomes in fitness programs, and monitor their vital signs. One in every four residents is currently using a wearable device, ICAA’s research indicates. You can use VR to explore the world and interact with others, from the comfort of your own home. Milner sees these devices as the simplest entry point for residents and staff to embrace wellness tech. “It makes sense as to where wearables play a hand in medical life,” he said. The biggest obstacle right now is wearables are made solely for individual use, Maplewood Senior Living VP, Clinical Innovation and Population Health Brian Geyser told SHN. Products like Apple Watch are a step in the right direction, but there needs to be a focus on developing software platforms to connect multiple individual accounts. Ziegler, through its Link-Age funds, invested in companies that allow multiple individual wearables to be monitored through one platform, Hopper said. In 2015, Link-Age invested $2.1 million of seed funding in IncludeHealth, which makes exercise machines geared toward people with disabilities. IncludeHealth’s platform is compatible with Apple Watch. Best Buy’s (NYSE: BBY) $800 million acquisition of senior-focused tech company GreatCall last August was made with an eye toward gaining market share in portable, affordable technology geared toward aging in place. Given Best Buy’s infrastructure, including Geek Squad tech support, it’s possible that this is one route for deploying a wearable on an enterprise basis. GreatCall offers smartphones, flip phones, medical alert devices and a wearable, which can track fitness goals, detect falls, offer daily health tips, do cognitive exercises, and provide urgent care response in emergency situations. Subscription-based services are growing in popularity with operators, and provide an inroad to incorporating tech into wellness. From a cost perspective, there is a smaller upfront investment, Hopper said. But subscription models allow residents to pay as they go and cancel a service at any time. Westport, Connecticut-based Maplewood has a suite of technology platforms geared toward promoting socialization, better engagement during group activities and cognitive stimulation. The company is a partner in Live Living Network, a subscription-based streaming platform allowing seniors access to live and interactive programming, which launched in all of the company’s communities last November. The service gives residents access to concerts, travel programs, educational programs and activities at the control of a remote. “We’ve invested a lot of time, energy and effort to make this relevant,” Geyser said. Maplewood is able to track the number of communities and residents participating in and engaging with Live Living Network in real time. This will allow programmers to refine the program to be more entertaining and relevant for subscribers. Milner noted one drawback to the subscription model. Virtual reality platforms have gained a foothold in the industry the past few years, and this is another tech with great promise in supporting wellness. Two years ago, Maplewood piloted Rendever, a VR platform primarily for memory care patients. Maplewood is now piloting VR as a physical therapy tool, allowing residents with mobility challenges to increase their range of motion and balance, Geyser said. VR headsets will grow in popularity with independent living and active adults because the technology has the potential to provide an escape from their everyday lives, to be used as an educational platform and as a social engagement tool, Milner said. Ziegler Link-Age Fund II focuses on deploying capital into VR and artificial intelligence companies because those are the technologies developing faster, Hopper said. Ziegler invested in Embodied Labs, a VR platform geared to training caregivers to better treat their patients by immersing them in virtual simulations of what a senior goes through when their conditions deteriorate. While seniors are demanding more tech-friendly devices and platforms to use, senior housing staff remain hesitant to fill the need, because they do not have specific tech adoption strategies in place, Milner said. Training on tech platforms and devices also leaves something to be desired. ICAA’s research indicates that online tutorials are the most ineffective training tool: 87% of survey respondents said tutorials were offered, but only 27% of staffers believed it was effective. The most effective training occurred when someone from the tech platform conducted the training. Seventy-one percent of communities surveyed by ICAA said they offered training by someone directly connected to a tech company. However, only 46% of staff said it was effective. Hopper believes staff are not receptive to training because instructors are trying to cram too much into a short session. 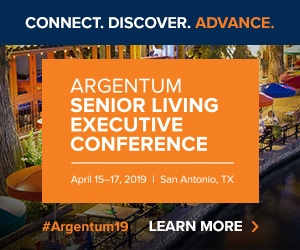 Interested in learning more about the wellness revolution in senior living? Click here to access Senior Housing News’ deep-dive report on the topic.